The 4415 Fireplace | FPX 4415 ST GSR2 | Linear Fireplaces deliver the best in heating and design with twice the fire view. Explore this see thru gas fireplace today! 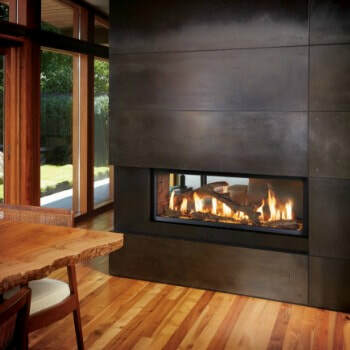 This Fireplace Xtrordinair is a modern linear gas fireplace. With double the fire view, this unit delivers epic style and heat. The 4415 ST can heat up to 1,200 square foot space. Enjoy the contemporary design; complete with a row of soaring flames accented by the glow of under-lit glass shards. The finest see-thru fireplace on the market, this unit is paramount in quality and safety. An almost transparent, ANSI-Compliant safety screen is placed over the clear glass. Also, this unit features a durable 14-guage steel fireplace body. Meticulously crafted in Washington, this unit’s design delivers a spellbinding display of the fire in two living areas.